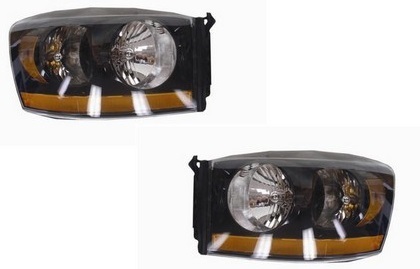 TYC Nightrunner Headlights 06-08 Dodge Ram TYC Nightrunner Headlights 06-08 Dodge Ram, TYC LH-DOPU06B-TYC-L-A Headlight, TYC LH-DOPU06B-TYC-R-A Headlight, 06-08 Dodge Ram Black Headlights, 06-08 Ram Black Headlights, 06-08 Ram Headlights, 06-08 Ram Black Headlights, Dodge Ram Headlights, Dodge Ram [LH-DOPU06B-TYC-L-A-R-A Headlight] - $279.95 : 3rd Strike Performance, Your Source for Late Model MOPAR Performance Parts and Accessories! One of the most trusted names in aftermarket automotive parts is TYC, a Genera brand. They make OEM-replica products to the exact same specifications as the original parts themselves. They make their parts overseas, and even though their parts are virtually identical to the OEM factory parts, you end up paying what averages out to be about a quarter of the price most times! TYC has been making OEM-grade aftermarket parts for a very long time, and is a name you can trust in the automotive industry. Adding HID/LED bulbs will void warranty!